Your Community Shop has just completed a second successful year of trading, generating a Profit before Taxation in the order £1,100. This is ahead of the target of £775 for 2018/19 in the 4 Year Business Plan published in early 2017 when the Community decided to invest in the enterprise. Sales of just over £186,000 were 3.4% ahead of last year, some of which reflected a full year’s trading compared to 51 weeks in the prior year. We finished the year strongly with sales in the December 2018 to February 2019 quarter 11% ahead of the equivalent period last year. This was driven by a marked rise in average spend per visit. Hopefully, this means we are getting better at stocking what you, the customers, want to see the shop sell. The recent customer survey has helped in this regard. The most pleasing aspect was an improvement in the gross margin which, as we have previously said, is critical if the village is to have a sustainable operation for the future. This year’s gross margin was 15.5% compared to 14.3% last year. The increase stemmed from a combination of selling price changes, improved purchasing terms with some suppliers and more experience of running the business. A further increase in the gross margin is expected next year when the full year effect of these factors flows through. A reduction in the outreach fee received from Bude Post Office was offset by a contribution of £750 from the Parish Council’s Community fund. This provided funding for overtime payments to enable Post Office services to be maintained during the majority of staff holidays. Overhead costs were in line with expectations although higher than the previous year when we benefited from a number of introductory deals. Stocks rose during the year by almost £800 to £13,500 in February 2019. We continue to work to broaden the breadth and depth of the range, focussing on local produce wherever possible. The year end (and half year) stock take was conducted by an independent professional firm. Cash balances remain healthy. After the Independent Accountants’ review, the full accounts will be presented to members of the Community Benefit Society at its AGM on 17 June. At that meeting, the Management Committee hope to be able to share plans regarding possible future developments. Overall, a satisfactory six months in our second year of trading. Sales of £95,074 were 2.6% higher than in the first half of last year. The growth was in March when the blizzard conditions boosted trade. Since then, sales have been slightly less than last year in most months. This partly reflects changes in the customer base and also an inability to supply lunchtime sandwiches and certain snacks following the receivership of a supplier in April. A replacement supplier is now being trialled. The first half gross margin moved up by 0.5% to 15.3% but remains well below industry norms. This is partly a function of the product mix. Almost 20% of sales come from very low margin tobacco products and a further 14% from newspapers where a c15% margin is generated but the retailer has no way of improving on this. To have a robust business, we do need to increase the overall gross margin further. Other sources of income – National Lottery commission and Post Office out-reach fees – were both lower than in 2017, offset in part by the contribution from our first birthday raffle which also raised £130 for the Air Ambulance. For the 2018/19 financial year, £750 of Post Office funding is coming from the Parish Council’s Community Fund following a cut in the fee received from Bude. £375 of this has been included for the first half. Total income was £16,522 in 2018 compared to £15,794 last year. However, first half overhead costs of £15,179 were £869 up on 2017. This reflects salary inflationary increases, obligatory pension costs and most significantly, the expiration of a number of introductory discount arrangements we benefited from last year. Electricity usage has been higher due to the heatwave. Trading profit in the first half was £1,343 which was close to the last year’s result. The Balance Sheet remains strong. Trading stock (verified by an independent count and valuation) stood at £15,043 on 1st September. Cash balances, net of all payments due to creditors, were c£7,500. struggle to cover absences for holiday or illness. Thank you to all who have assisted. As always, if anyone has some time to spare for this community project, please contact Anna or Caroline. In order to try and ensure we are delivering what you, the customers, want we are going to run a survey over the next few months. Please do take the time to complete this so that we can target areas to try and improve. The current Management Committee endorses this view. 1. Annual Accounts for the period ending 28th February 2018 3 sets are available at the meeting for anyone who wishes to browse through them this evening. Copies of the full accounts are available to all members on request, either by email or in hard copy. • Statement of Comprehensive Income Sales were £180,179 and gross profit was £25,770. Other Operating income of £6,367 comprises £2,683 Post Office out-reach fees, £1,265 Lottery commission and £2,419 of donations, including £670 in lieu share purchases. Staff costs, rent and electricity account for over 80% of administration costs of £31,025. Profit Before Taxation was £1,112. • Statement of Financial Position as at 28th February 2018 Fixed assets were fully funded by a Cornwall Community Fund grant. Apart from cash, the main asset is stock which has doubled since acquisition as we have increased both the breadth and depth. We have a strong balance sheet with healthy cash balances of £13,011. • The Independent Accountants’ Report from Metherall Gard Ltd of Bude. • to Anna and Caroline for managing the operation. • the 21 volunteers who have helped by serving in shop and several more who work behind the scenes. • Lastly, but by no means least, thank you, the shareholders and all the other customers for your support. • we are over-reliant on a small core of volunteers when holiday or sickness cover is required. • the 4-year lease on the current premises expires in March 2021. The outgoing Management Committee therefore see a period of consolidation for the next 6 to 9 months - running the business, improving profitability and engaging the Community further. • or whether we should be thinking more in terms of a wind down as March 2021 approaches, having given it our very best shot to secure a long term future. How can you, the members, help? Obviously by using the services provided as much as you realistically can. Increasing last year’s sales of £180,000 by 10% to nearer £200,000 would significantly boost profitability. One question I would like everyone to ask themselves is: “What could I realistically buy from my Community Shop in addition to those items I regularly buy”? On the display table you might see some examples of things you did not know the shop sells. Did you know you can pre-order from over 50 varieties of bread and cakes on a daily basis, buy locally hand-made cards, obtain cheap toiletries, that cream teas are coming? Also, if you are able to, you can of course help by volunteering some of your time. Results of the election of those who will serve on the Management Committee going forward. At the meeting held earlier this evening; Lesley Booker, Sarah Courthope, Stephen Peters, Karen Poole, Micheline Smith and Stephen Smith were elected to serve on the new Management Committee and will take office at the end of this meeting. Following a half year stock take on 1st September 2017 carried out by external professionals, we now know the shop has traded profitably in its first 6 months. A pre-tax profit of £955 was generated. Sales started slowly in March but improved from April onwards after the official opening, re-stocking and expansion of the product range and supplier base. Average spend per visit (excluding lottery and VAT) has settled at around £4.15. The expected seasonal upturn in weekly footfall occurred in the June to August period, historically the best quarter for the business. Sales in the second half of the year are likely to be lower than the first half out-turn of £93,611 because of this seasonal effect and slightly less trading days. Sales are forecast at £88,389 for the second half giving £182,000 for the 51 week trading period to 28th February 2018. Allowing for March’s slow start up and in a full 52 week year, sales are currently running at an annualised level of about £188,000. This is some 6% below the Business Plan. The average level of sales for a community shop across the UK is £155,000 (Plunkett Foundation). Now that a full stock count and evaluation has been undertaken, the gross margin (on non-lottery sales) for the first half is 15.7%. This is higher than the provisional figure of 13% used in the Business Plan and for internal reporting purposes for the first 5 months. It is supported by an analysis of estimated gross margin by product line based on purchases. It is however well below the average achieved by UK Community Shops of 26% (Plunkett Foundation) so there is scope for improvement. First half gross profit from sales of £14,717 was £1,717 higher than the Business Plan due to the higher margin. The gross margin in the second half has been forecast at 15%. This is lower than the first half partly because donations of locally grown produce are expected to be lower. Lottery commission fell below expectations however, in combination with the fees received for running the Post Office out-reach service, the contribution from these sources of £2,039 is slightly above the Business Plan for the half year and this is expected to continue. First half rent of £3,000 and basic salaries of £7,438 are fixed costs. Other overheads of £3,872 were £590 lower than in the Business Plan. This reflected a combination of volunteers undertaking many tasks free of charge, some re-sourcing of services and tight control. A grant of £1,084 made by Week St Mary Parish Council and a donation of £200 by the “Meet and Eat” group will cover all of the “once off” start up expenditure incurred e.g. new sign, licensee training and alarm system. Total overheads for the second half year are forecast at £15,318, £1,008 higher than in the first half. This is mainly because of an increased allowance for staff holiday cover. To maintain Post Office and banking services as much as possible, Anna and Caroline are sometimes able to work overtime when the other is on holiday. After providing for the salaried staff bonus programme (20% of final trading profit for the year) and additional rent payable under the terms of the lease, pre-tax profit was £955 compared to break-even in the Business Plan. A small additional profit is forecast for the second half. Corporation Tax will be payable at 20% on the full year’s profit and “founder donations” (see below). 111 members of the local community subscribed for £20,130 of share capital in Week St Mary Community Shop Limited and a further 5 made founder donations of £670. £6,879 was spent on stock at acquisition on 5 March 2017, leaving £13,921 of cash. Capital expenditure totalling £1,782 (new chiller, fruit & veg display unit and laptop/printer) has been made, fully financed by a grant from the Cornwall Community Foundation and Stockholding has almost doubled to c£12,800 in line with Business Plan projections to provide a better shopping experience and improve the business. Trade creditors were £6,594 at 2nd September 2017. Virtually all were paid within 10 days of the period end as wholesalers’ direct debits were applied and local suppliers’ accounts are settled promptly. Deducting these liabilities and other net accruals of £914 from the cash at bank balance of £16,078 leaves £8,570 of cash. It is pleasing to be able to present such a positive report after 6 months of trading. This is of course the result of the collective efforts of a considerable number of community members. 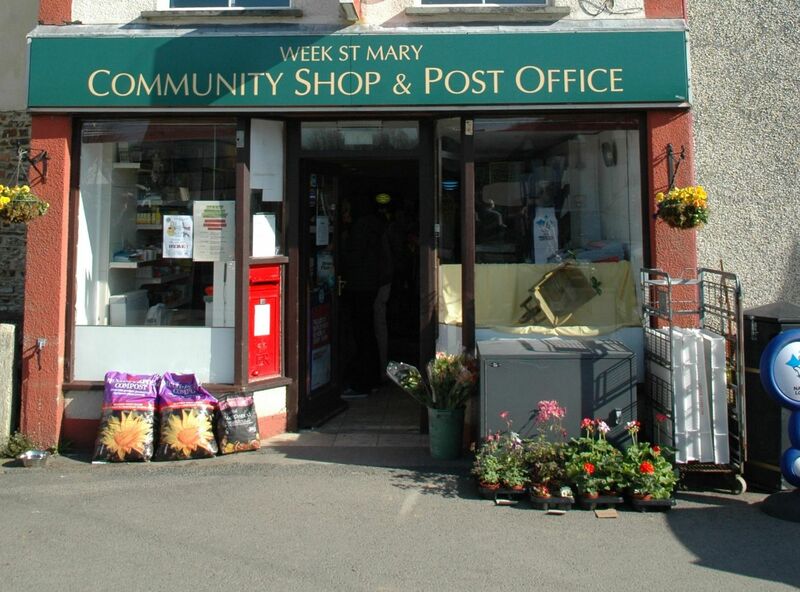 On-going support on both the customer and organisational fronts is a pre-requisite but, providing this is forthcoming, there appears no reason why the community of Week St Mary cannot continue to own and operate a modestly profitable shop and Post Office for the benefit of the community. Tangible evidence of this was the primary objective of Phase 1 as set out in the Share Issue Prospectus of January 2017 and the accompanying Business Plan. Phase 2 involves securing a long-term home for the enterprise as the present lease expires in 3 and a half years’ time i.e. March 2021. The Management Committee will start to address this over the coming months. Any member/shareholder of Week St Mary Community Shop Ltd who would like to request a copy of the half year Profit & Loss Account and Balance Sheet should contact me on sasmith007@yahoo.co.uk.